Have you talked about a hate group recently? 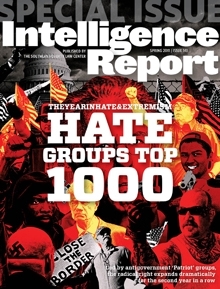 The Southern Poverty Law Center reports that, for the first time, it’s annual count of active extremist groups in the U.S. has surpassed 1,000 groups. ; a 7.5 % increase from 2009 and a 66% rise since 2000. Thirteen of them are in Washington State: Washington State Hate Groups Map. These groups gain strength when they remain unchallenged and mostly invisible. Have you talked about hate groups recently? I was having a conversation with three other women recently; two white and one black. We all are involved in helping people to develop awareness, knowledge and skills around how racism operates. I was disappointed and frustrated with what happened. You are currently browsing the White matters blog archives for February, 2011.